Posted on June 13, 2018 by Editor Posted in Health and Wellness	. No one wants to see their child suffer from asthma, especially on days when they’re at school and you can’t be around with them to monitor their activities. 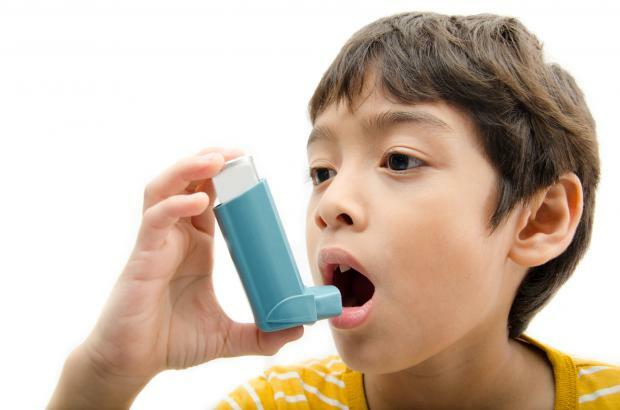 Helping your child manage asthma effectively, however, will greatly improve his/her quality life. Knowing what triggers your child’s asthma can make management a lot easier. Compiling a list of the possible triggers and the accompanying symptoms will also be helpful during regular check-ups and for teaching your child what to do in case he/she is having an attack. If you know what triggers the child’s asthma, it would be easier to create a home that is safe for the child, because you have more control over your home than if the child is in school or other public places. Limit his/her exposure to such triggers and ask for cooperation from family and friends. 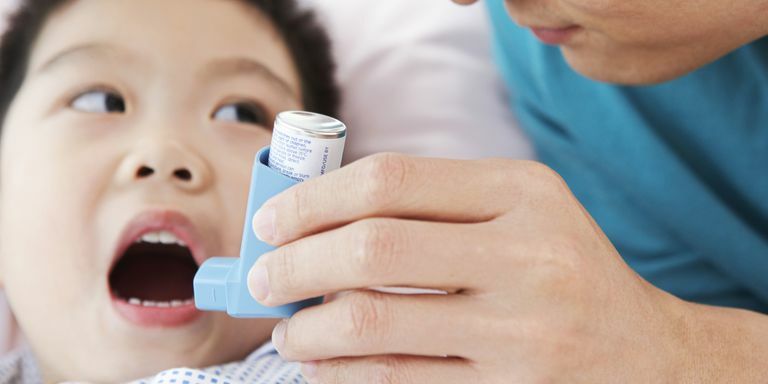 Long-term asthma treatments can be stressful for both the child and the parents, that is why you will also need the help of other people who will be around your child as he/she is growing up. Inform relatives, teachers, coaches, and friends of the child so that they can assist whenever an attack occurs. This will also educate other people about the illness and they will be more than willing to help create a safer environment for the child in the classroom. A detailed record of all your child’s medications, treatments, and information on what to do during an attack will greatly improve the child’s quality of life. You are responsible for making sure that your child is getting the best treatment possible and that his/her medications are up to date. It would also be helpful if you are familiar with the prescribed medications, the proper dosage, and possible side effects so you don’t panic when something goes wrong. 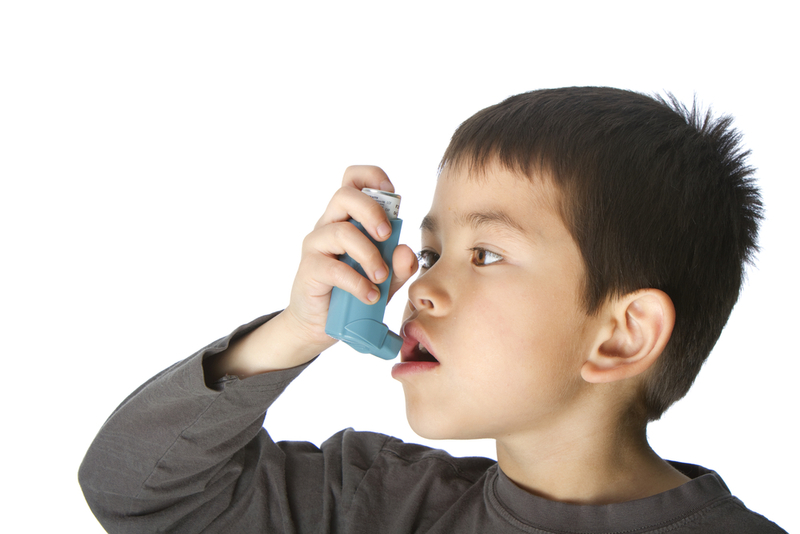 Even if your child has asthma, it does not mean you should keep him/her at home all the time. A growing child needs to live an active life just like every other child. Talk to the pediatrician about activities that can help improve the child’s condition such as outdoor and indoor sports. If you can, ask the help of a trainer or the school coach to monitor the child’s activities in case an attack happens. You should always have an asthma action plan ready in case an attack happens. Make sure that your child and other people who will be monitoring him/her are also aware of what to do. First, memorize the symptoms of an asthma attack, then help the child to calm down and sit up straight. Next, help the child take a puff of the reliever inhaler (up to a maximum of 10 puffs) once every 30 to 60 seconds. Finally, take the child to a clinic or hospital if the symptoms do not improve. Posted on June 13, 2018 by Editor Posted in Good Skill Set	. Fortunately, glass windows are easy to clean and maintain with basic equipment and a regular cleaning schedule. Here are tips to make the task easier. Most glass windows can be cleaned with basic equipment such as a squeegee, scrubber, bucket, lint-free towels, and dishwashing liquid. You can also use commercial cleaning products made for glass windows that usually come with a free towel or scrubber. You might also need a ladder and an extendable handle for the squeegee if the windows are high. 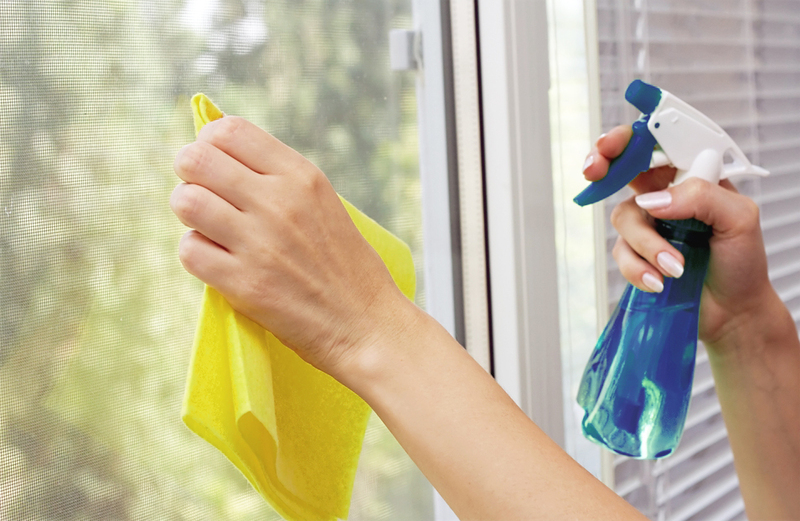 Remove loose dust on the windows with a dusting cloth or a microfiber cloth. You should also change and wash the curtains and remove all accessories or decorations near it. Don’t forget to wipe the sill, frame, hinges, handles, and knobs, then cover the window sill and frame to protect them from the drips. Although there are commercial cleaners for glass windows, dishwashing liquid is safer to use and is also gentler on the hands. Create a soapy solution in a gallon-sized bucket filled with cool water (preferable distilled water to avoid mineral buildup) and a teaspoon of dishwashing liquid. Just dip the scrubber, sponge or squeegee in the bucket and you’re ready to clean. 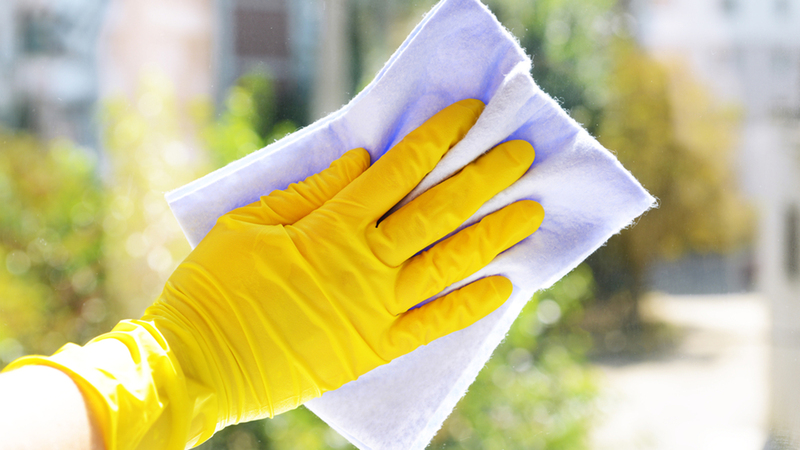 You can also use white vinegar to sanitize, deodorize, and to remove stubborn grime. 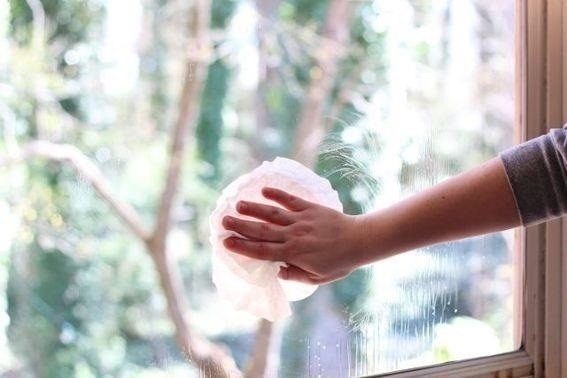 Cover every inch of glass with the soapy solution using the scrubber or the sponge, including the edges to make sure that you remove all the dirt. Then, you can work the squeegee in any direction you want, but move it in one direction when removing the excess water. When you’re satisfied that you’ve removed all the dirt on the glass windows, use the squeegee to remove the excess water by tipping it so that only its corner is making contact with the window. Starting from the top corner of the glass, create a clean, narrow strip on one side. Create several clean strips from top to bottom until you have removed all the excess water. Finally, make clean strips across (left to right or right to left) the window by repeating the same process. Squeeze most of the soapy water from the scrubber and the squeegee before finishing one window. Do not drop the scrubber and squeegee into the bucket, instead, place them on the side so that there are no excessive running and dripping. Then, using the lint-free rag or a microfiber cloth, wipe off the excess water and suds on the edges of the glass window. Repeat the same process above in every panel. If the windows are large, it would be more manageable to divide the glass into sections for easier cleaning. If the blade in your squeegee looks worn out, you need to replace it by removing the clips, screws or lamps that hold it near the handle.